THE WOODLANDS, TX -- What started as a bad day for a waitress in the Woodlands turned out to be a night she'll never forget. 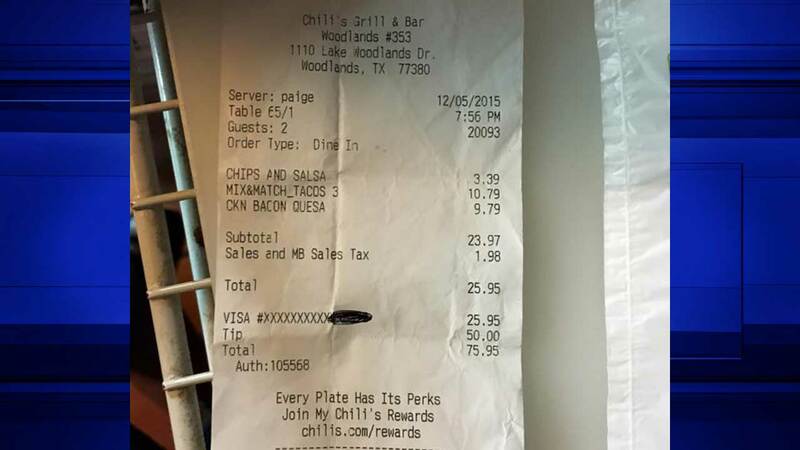 Paige Valles was waiting tables at a Chili's in The Woodlands Saturday. Towards the end of her shift, she says she was upset. That's when a couple she was waiting on noticed and asked if they could pray for her. Together, the three of them prayed...and cried. Later that night, Paige noticed that the couple had left her a $50 tip on a $25 tab. According to Paige, it wasn't the tip that made the night so special. Rather, it was the couple reaching out in her time of need. "The fact that they didn't even know me, I was some random person to them," said Paige. "And that was amazing." Paige says she's sharing the story to let people know there's still good in the world and to never lose faith when things aren't going well.